It was early spring; winter was finally past with nicer weather here to stay. Not wanting to be inside any longer, I was anxious to get "out there" and start clearing up the gardens around our house. One sloping bank in particular was a mess of weeds and downed limbs, as well as being home to mounds of leaves from the previous fall. 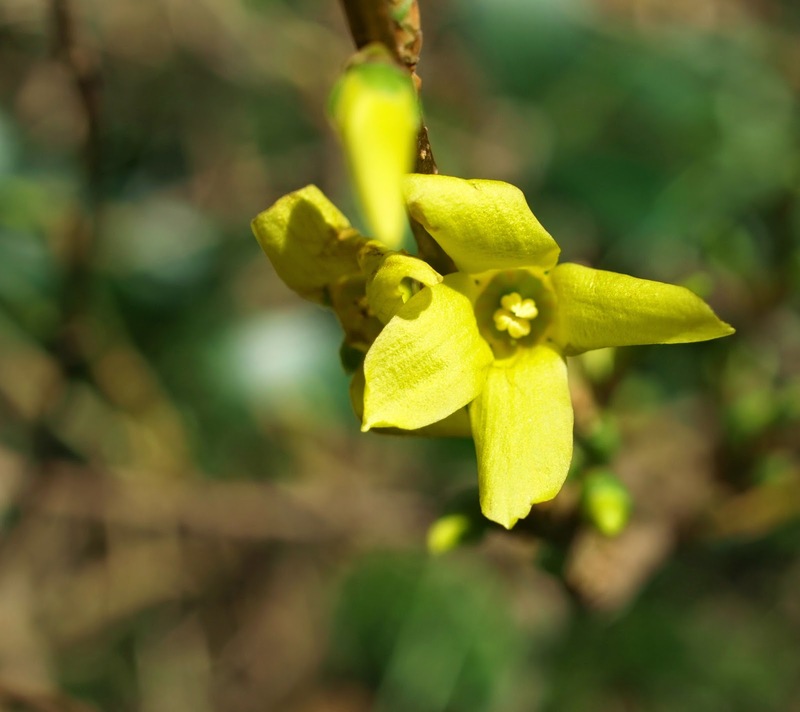 My husband had planted tall spikes of forsythia along the upper edge of the bank, and I was eager to free the budding branches so eventually they could bloom in all their glory. I attacked the overgrowth with gusto. I pulled, tugged, threw to the side, cleared and pruned to my heart's content. Happy with my progress, I was almost to the end of my crusade when a spot of color caught my eye. All movement stopped for a moment. I wasn't sure what I was seeing because it was nestled so deep in the underbrush. Only after I had a chance to move the surrounding debris was I able to see the source of the color - the first forsythia bloom of the season. I stood there in awe. This perfect beauty, produced from the branch that had been buried beneath the muck and the mire. Flower bursting forth from the limb that had been denied all but a little light. Apparently, the one with the most junk dumped on it blooms first. Sounds like something out of Life 101. We all have weights bearing down on us in our lives; no one escapes that fact. Some come for a season or a time and then leave; others make their nests in our days and roost. This overgrowth, this debris, these heartaches and pressures and unwanted circumstances that threaten to bury us and squeeze out the light in our lives - they don't come to weigh our heart down for no reason. God allows them into our lives to help us to grow, to flourish, to bloom. We usually don't recognize them as beneficial fertilizer (because we're too busy trying to make them go away), but God knows they are exactly what our soul needs in order to produce the sweet blossoms that represent Him changing a life. Life exists under the mess. It's there for a reason. It's the mess that provides the nutrients for our growth. So keep calm and bloom on. This is so true. I get up in the morning with So. Many. Plans. Plans in my calendar. Plans on my mind. More scribbled on paper. Plans I alone have made, yet before God I can't help but acknowledge that only He knows my day. He has it planned. And His plans could very well not be mine. Sometimes the sheer volume of tasks on My List overwhelms me and I think, "How will I get this all done?" I can feel my heart race and panic set in. Truth is, often there really aren't enough hours in the day - for my plans. The best advice I've read on priorities comes from the book Lies Women Believe and the Truth that Sets Them Free by Nancy Leigh DeMoss. In it she writes, " The Truth is all I have to do is the work God assigns to me. What a freedom it has been for me to accept that there is time for me to do everything that is on God's 'to do' list for my day, my week and my life!" I love that concept. I'm betting that God's to-do list for me looks way different than mine. Think Mary vs. Martha. Yeah. That. I'm not sure what I've been waiting for, but I do know that I've been waiting for something to be perfect before I write on this blog. At any rate, I decided to break the silence and stop waiting for perfect and just write. If I wait for perfect to arrive, the world is going to slip by without me because it's broken and in no way can manifest perfection. Believe it or not, there is good news for all of us in all of this. The good news is that God doesn't wait for you to be perfect, doesn't wait for me to be perfect. He wants us just as we are, with our imperfect hearts, lives and souls. He's already made us perfect through Jesus. No more waiting. It's done. It's so simple, really. And it doesn't get much perfect-er than that. So go ahead. Jump into whatever it is that's calling your name long before perfect comes down the pike. Long before you've got your ducks in a row, planets aligned, checkbook balanced. Tomorrow those things won't be. Because, you see, in this world perfect never comes and stays. Yet perfect, in Jesus Christ, is already here. And will last forever.